Written by locals, Fodor's Essential India is the perfect guidebook for those looking for insider tips to make the most out their visit to Delhi, Mumbai, and beyond. Complete with detailed maps and concise descriptions, this India travel guide will help you plan your trip with ea... read full description below. Written by locals, Fodor's Essential India is the perfect guidebook for those looking for insider tips to make the most out their visit to Delhi, Mumbai, and beyond. Complete with detailed maps and concise descriptions, this India travel guide will help you plan your trip with ease. India is a country of vibrant and enticing contrasts: exquisite palaces are juxtaposed against simple temples, and modern high-tech industry coexists with ancient customs and rituals. 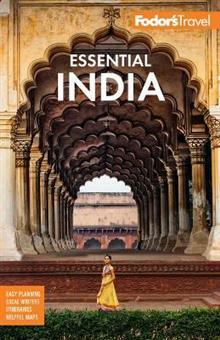 There's much to see and do in this vast and geographically diverse country, and Fodor's Essential India covers the must-see sights better than anyone else. Fodor's Essential India Includes: *UP-TO-DATE COVERAGE: India is changing rapidly, and this fully updated guide includes the best new hotels, restaurants, and more in its vibrant cities and stunning countryside, from Delhi and Rajasthan to Mumbai, Kerala and Goa. *ULTIMATE EXPERIENCES GUIDE: A spectacular color photo guide captures the ultimate unmissable experiences and attractions throughout India to inspire you. *DETAILED MAPS: Full-color and full-size street maps throughout will help you plan efficiently and get around confidently. *GORGEOUS PHOTOS AND ILLUSTRATED FEATURES: Full-color photos will help inspire you. The illustrated features on the iconic Taj Mahal, the holy city of Varanasi on the Ganges, and the amazing cave temples at Ajanta and Ellora will give you a deeper understanding of these historic sites. The Understanding India chapter, with illustrated sections on modern society, religion, food, dance, music, and shopping, provides insight into contemporary Indian life as well as the past. *ITINERARIES AND TOP RECOMMENDATIONS: Sample itineraries will help you plan and customize your own itinerary so you can make the most of your time. Includes tips on where to eat, stay, and shop as well as information about nightlife, sports and the outdoors. Fodor's Choice designates our best picks in every category. *INDISPENSABLE TRIP PLANNING TOOLS: A full-color feature on getting around India includes indispensible information on buses, trains, taxis, and rickshaws, along with tipping information and an easy-to-use Travel Times Chart. Convenient overviews show each region and its highlights, and detail-rich chapter planning sections have on-target advice and tips for planning your time and for getting around the country by car, bus, and train. *COVERS: Delhi, Agra, Jaipur, Udaipur, Mumbai, Goa, Kerala, Kolkata, The Taj Mahal, Rajastan, Beaches, and more. ABOUT FODOR'S AUTHORS: Each Fodor's Travel Guide is researched and written by local experts. Fodor's has been offering expert advice for all tastes and budgets for over 80 years. Planning on visiting more of Asia? Check out Fodor's Essential Thailand and Fodor's Essential China.